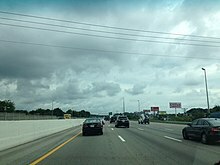 This article is about the section of Interstate 40 in Tennessee. For the entire route, see Interstate 40. Interstate 40 (I-40) traverses the entirety of the state of Tennessee from west to east, running from the Mississippi River at the Arkansas border to the northern base of the Great Smoky Mountains at the North Carolina border. The road connects Tennessee's three largest cities—Memphis, Nashville, and Knoxville—and crosses all of Tennessee's physiographical provinces and Grand Divisions—the Mississippi Embayment and Gulf Coastal Plain in West Tennessee, the Highland Rim and Nashville Basin in Middle Tennessee, and the Cumberland Plateau, Appalachian Valley and Ridge Province, and Blue Ridge Province in East Tennessee. The Tennessee section of I-40 is 452 miles (727 km) long, the longest of any state. I-40 enters Tennessee from Arkansas via the six lane Hernando de Soto Bridge, which spans the Mississippi River at river mile 736. Immediately within the city of Memphis, the interstate passes across the southern half of Mud Island before crossing the Wolf River Harbor into downtown Memphis. Throughout Memphis, the highway contains a minimum of six through lanes, except through major interchanges. About one mile from the state line is an interchange with the western terminus of Interstate 240, where I-40 abruptly turns north, following a route formerly designated as part of I-240. About one mile later, the highway has an interchange with State Route 300, a connector to US 51 and the future Interstate 69. At this interchange, the interstate turns east and enters a stretch designated as the Dr. Martin Luther King Jr. Memorial Expressway. I-40 crosses the Wolf River three times in Memphis as the road passes near the neighborhoods of Frayser and Raleigh and turns southeast. A few miles later, I-40 has an interchange with I-240 southbound and Sam Cooper Boulevard eastbound, and turns sharp northeast, leaving Memphis. For the next several miles the highway is known as the Isaac Hayes Memorial Highway and is eight lanes, the left lanes functioning as HOV lanes during rush hour, passing through several major suburbs of Memphis, including Bartlett, Cordova, and Lakeland. At exit 18, which is with US 64, the highway narrows to six lanes, and to four lanes a short distance beyond. Several miles later, near Arlington, is a cloverleaf interchange with I-269. East of Arlington, I-40 crosses the Loosahatchie River and leaves the Memphis area, traversing through the Gulf Coastal Plain in a very flat and straight stretch of mostly farmland with some rural woodlands, bypassing most cities and communities. South of Brownsville, about 40 miles east of Memphis, the highway turns north and enters the Hatchie National Wildlife Refuge and crosses the Hatchie River. Upon exiting the refuge, I-40 turns east and passes just southeast of Brownsville. The interstate continues for the next 20 miles though further agricultural terrain, and at mile marker 78, the crosses the South Fork of the Forked Deer River into Jackson. Passing through the northern half of the city, I-40 has a total of six exits in Jackson. From Jackson, I-40 continues east northeast through a sparsely populated area of farmland and woodlands, and near the community of Parkers Crossroads, has an interchange with SR 22, a major north-south connector route in west Tennessee. Several miles later, I-40 proceeds for several miles through the northern half of the Natchez Trace State Park, and has an interchange with US 641/SR 69, another major north-south corridor, at milepost 126. The route then descends about 400 feet (120 m) on a steep grade over the course of a mile before crossing the Tennessee River into Middle Tennessee on the Jimmy Mann Evans Memorial Bridge. East of the Tennessee River, I-40 traverses through mostly vast woodlands in the rugged hills of the Western Highland Rim for a considerable distance. This section is characterized by several noticeable upgrades and downgrades, with mostly minor curves. About 35 miles later, the highway passes southeast of Dickson, now within the Nashville metropolitan area. A few miles later, approximately 35 miles west of Nashville, is the western terminus of Interstate 840, the outer southern beltway around Nashville. The highway continues through mostly woodlands and descends into the Nashville Basin between mile markers 186 and 188. Around Bellevue, the route widens to six lanes, entering the urban outskirts of Nashville. About ten miles later, I-40 has an interchange with the western terminus of State Route 155 (Briley Parkway), the northern controlled-access beltway around Nashville. About two miles later is the western terminus of I-440, the southern loop around central Nashville. Two miles later, I-40 enters Downtown Nashville, and has interchanges with several major highways and surface roads. In Nashville, I-40 shares brief concurrences first with I-65 and then I-24, before splitting off. The eastern terminus of I-440 is directly accessible from the easternmost interchange with I-24. About 1.5 miles later, I-40 has an interchange with SR 155 (Briley Parkway) near the Nashville International Airport. The route continues east for the next 20 miles through a still-developing area with eight lanes, the left lanes functioning as HOV lanes during rush hour, passing near the suburbs of Mount Juliet and Gallatin. At mile 219, I-40 crosses the Stones River just downstream from the Percy Priest Dam. About 25 miles east of Nashville, the route narrows back to four lanes and has an interchange with the eastern terminus of I-840 a few miles east of Lebanon. The interstate continues for roughly 50 miles (80 km) across mostly open farmland, passing near mostly small communities. In Smith County between mileposts 263 and 266, I-40 crosses the meandering Caney Fork River five times before ascending the Eastern Highland Rim, reaching 1,000 feet (300 m) for the first time in the state near Silver Point. The interstate remains relatively flat across the plateau, beginning at the edge of the table-top rim at mile marker 272 near Baxter. The highway continues for about 15 miles through a mix of farmland and woodlands, before reaching Cookeville, where it has interchanges with several highways including SR 111, a major north-south connector to Chattanooga. For the next 20 miles, I-40 passes through a predominantly wooded area, ascending the western escarpment of the Cumberland Plateau and reaching elevations above 2,000 feet (610 m), before reaching Crossville. At mile 308, I-40 crosses the Tennessee Divide, where the Cumberland and Tennessee River watersheds meet. The divide is marked in the eastbound lanes with a sign reading "Entering Emory River watershed." In the westbound counterparts is a sign noting the beginning of the Caney Fork watershed. After ascending further up into the Walden Ridge/Cumberland Plateau and passing through Monterey, I-40 remains relatively flat and straight as it continues across the Cumberland Plateau and passes through the northern part of Crossville. East of Crossville, the Crab Orchard Mountains, the southern fringe of the Cumberland Mountains, come into view as the road descends several hundred feet. At mile 329, the interstate enters Crab Orchard Gap and proceeds through a narrow valley once prone to rockslides. At mile 340, the Interstate crosses into Roane County entering the Eastern Time Zone, and shortly thereafter the road begins its descent of the Cumberland Plateau into the Tennessee Valley and the speed limit is 60 mph to 70 mph. I-40 hugs the slopes of the plateau's Walden Ridge escarpment for several miles, containing what some describe as dramatic views of the Tennessee Valley below to the south, before reaching the base of the plateau at mile 347 between Harriman and Rockwood. As it enters the Ridge-and-Valley province of the Appalachians, of which the Tennessee Valley is a part, I-40 crosses a series of ridges and valleys characteristic of the region's topography. At mile 351, the road crosses the Clinch River, with the Kingston Fossil Plant and its 1,000-foot (300 m) twin smokestacks dominating the view to the north. At exit 368, about 20 miles west southwest of downtown Knoxville, I-40 merges with I-75, which continues to the southwest to Chattanooga, and widens to six lanes. The two highways pass through several of the suburbs of Knoxville, and exits are numbered according to I-40 mileage along this stretch. At exit 374 (SR 131/Lovell Road), the highway widens to eight lanes and the speed limit drops to 55 mph., and at the next exit, has an interchange with the Pellissippi Parkway (SR 162 westbound, Interstate 140 eastbound), which connects to Oak Ridge and Maryville, respectively. At exit 385 is an interchange with the western terminus of Interstate 640, a beltway which passes northwest of downtown Knoxville. Also at this exit, I-75 splits off from I-40 onto a concurrency with I-640, splitting off a few miles later and heading towards Lexington, Kentucky. The route then enters downtown Knoxville, passing near the main campus of the University of Tennessee, as well as several residential neighborhoods, and has interchanges with US 129, I-275, US 441, and SR 158. I-40 is a minimum of six through lanes through the entirety of central Knoxville, containing several short segments of auxiliary lanes between exits. The highway then enters a predominantly residential area, passing next to the Knoxville Zoo, before coming to an interchange with the eastern terminus of I-640 and leaving Knoxville. For approximately the next thirty miles beyond Knoxville, I-40 is six lanes and the speed limit is 65 mph and 55 mph for trucks, traveling through a predominately rural and agricultural area and passing near several cities and communities. Exit 407, reportedly one of the busiest and most congested non-interstate exits in the state, is the primary means of access to tourist attractions in the cities of Pigeon Forge, Sevierville, and Gatlinburg, as well as the Great Smoky Mountains National Park. At exit 421 is the beginning of Interstate 81, which runs into Northeast Tennessee to the so called "Tri-Cities" of Bristol, Kingsport, and Johnson City. At this interchange, the route narrows to four lanes and turns sharp south, crossing the Douglas Dam impoundment of the French Broad River, and passing Newport along the northern base of English Mountain for several miles. At mile 440, the road turns south through the gap between English Mountain and Stone Mountain, revealing a dramatic view of the 4,928-foot (1,502 m) Mount Cammerer at the northeastern end of the Great Smokies range, and the road proceeds into the Pigeon River Gorge through the Blue Ridge Mountains, closely following the north bank of the river. This section is extremely curvy and contains a 55 mph speed limit due to its susceptibility to accidents. This stretch is also prone to rockslides, and contains mesh nets along some of the cliff slopes as preventative measures. I-40 enters North Carolina about 4 miles (6.4 km) east of the unincorporated community of Hartford, Tennessee. The term Music Highway refers to a section of I-40 between Memphis and Nashville. I-40 was designated as such by an act of the Tennessee Legislature in 1997 "from the eastern boundary of Davidson County to the Mississippi River in Shelby County," a distance of about 222 miles (357 km). I-40 is designated as such because of the rich music history in Memphis, Nashville, and the areas in between. Memphis is known as "the Home of the Blues and the Birthplace of Rock and Roll." Nashville is known as "Music City USA" for its influence on numerous types of music, especially country. Several cities and towns between the two, such as Jackson, Brownsville, Nutbush, Waverly and others were birthplaces or homes of numerous singers and songwriters. Signs that display the words "Music Highway" along with music notes are erected in both directions along I-40, especially at the borders of Shelby County and Davidson County. The Tennessee leg of I-40 was part of the original 1,047 miles (1,685 km) of Interstate Highways authorized for Tennessee by the Federal Aid Highway Act of 1956. The first section of Interstate 40, Nonconnah Creek to Hindman Ferry Road in Shelby County (originally I-240), was contracted in 1956, and within a year contracts had been awarded for sections in Davidson, Knox, Roane, Haywood, Madison, Jefferson, and Cocke counties. By 1958, sections in Loudon, Smith, Putnam, Cumberland, Humphreys, Hickman, and Sevier counties had been contracted. Work began on the approximately 1⁄2 mile (0.80 km) bridge over the Tennessee River on November 29, 1962, and was completed on July 21, 1965. The 10.5 miles (16.9 km) segment in Humphreys and Hickman Counties, including the bridge over the Duck River, was completed on November 24, 1965. I-40 was complete between Memphis and Nashville in 1966, between Nashville and Crossville in late 1967,, and between most of Nashville and Knoxville in 1968. The section along the Pigeon River Gorge in Cocke County, as well as into North Carolina, was initially believed by many to be impossible to construct. Construction of this segment was very labrous, requiring thousands of tons of earth and rock to be moved. This was done in the mid to latter 1960s, and construction was completed in 1970. 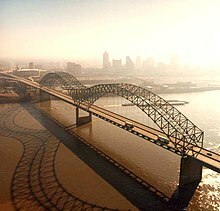 The last segment of I-40 in West Tennessee to be completed was the Hernando de Soto Bridge in Memphis, which broke ground in May 1967, and was opened on August 2, 1973. A 9.2 miles (14.8 km) segment west of Harriman, including the descent up Walden Ridge, was opened to traffic on August 19, 1974 after years of delays due to geological difficulties, opening the entirety of the route between Nashville and Knoxville. The final segment of I-40 in Tennessee, located between just east of what is now the eastern terminus of I-640 and exit 415 in Jefferson County was opened to traffic on December 20, 1974 in a ceremony attended by then-governor Winfield Dunn. This segment was constructed with six lanes, making it one of the first rural six lane sections of interstate in the country, and was opened on the same day that the last section of I-75 in Tennessee was opened. In Memphis, I-40 was originally slated to pass through the city's Overton Park, a 342-acre (138 ha) wooded refuge that had become an important stopover for migratory birds. Fearing that the interstate's construction would upset the park's fragile ecological balance, environmentalists, backed by the organization Citizens to Preserve Overton Park, waged a 12-year legal battle to prevent highway construction in the park, culminating in the United States Supreme Court decision, Citizens to Preserve Overton Park v. Volpe. The Supreme Court remanded the case to the District Court for further review, and it ruled that the highway commission had not adequately explored alternative routes. In 1981, the highway commission abandoned plans to route I-40 through Overton Park, and instead redesignated the northern portion of I-240 as I-40. For over 20 years, I-40 signage existed on the dead-end route toward Overton Park. Several miles of a limited-access road were actually built within the I-240 loop; this portion of highway still exists and is in regular use as Sam Cooper Boulevard, reaching the eastern end of Chickasaw Country Club and the Binghampton neighborhood, and then East Parkway. Since its initial completion, much of I-40 in Tennessee has been reconstructed or widened. Until June 12, 2009, a section of I-40 through downtown Knoxville between James White Parkway and Hall of Fame Drive was completely closed to all traffic for about 18 months for reconstruction. Through traffic was required to use I-640 or to use surface streets. The four-lane section, which was quite substandard, congested, and accident-prone, was widened to six lanes to improve traffic flow and safety. Several interchanges along that stretch were also reconstructed. The rugged terrain of East Tennessee presented numerous challenges for I-40 construction crews and engineers. Rockslides, especially along the eastern Cumberland Plateau and in the Pigeon River Gorge, have been a persistent problem since the road's construction. In December 1986, a truck driver was killed when his truck skidded across some rocks that had spilled across the road just east of Crab Orchard (between miles 331 and 333). In response, the Tennessee Department of Transportation (TDOT) flattened the cutslopes along this stretch of Interstate and moved the road 60 feet (18 m) away from the problematic cliffside. Twenty rockslides occurred along the Walden Ridge section (miles 341–346) of the eastern plateau in 1968 alone, prompting various remedial measures throughout the 1970s, including the employment of rock buttresses, gabion walls,[clarification needed] and horizontal drains. A minor rockslide shut down the right lane of westbound I-40 at mile 343 on May 6, 2013. An area very prone to rockslides is the Pigeon River Gorge, especially in the vicinity of the Tennessee–North Carolina state line. Throughout the 1970s, this stretch of I-40 was repeatedly shut down by rockslides, sometimes for several weeks at a time. In the late 1970s and early 1980s, TDOT dug over 24,000 feet (7,300 m) of horizontal drains, blasted out large volumes of unstable rocks, and installed massive mesh catchment fences. Nevertheless, rockslides in 1985 and 1997 again forced the closure of I-40 in the Pigeon River Gorge for several weeks. Additional stabilization measures were implemented, including the blasting of loose rock, the installation of rock bolts, and the construction of a better drainage system. In spite of these measures, another massive rock slide occurred in the Pigeon River Gorge on October 26, 2009, blocking all lanes just across the border at North Carolina mile 3. The section was closed to traffic in both directions until April 25, 2010. On January 31, 2012, the westbound lanes of I-40 were closed because of a rockslide near the North Carolina border. Traffic was detoured along I-26 and I-81 and reopened a few months later. Sinkholes are a consistent issue along highways in East Tennessee. One particularly problematic stretch is a section of I-40 between miles 365 and 367 in Loudon County, which is underlain by cavernous rock strata. In the 1970s and 1980s, TDOT employed numerous stabilization measures in this area, including backfilling existing sinkholes with limestone, collapsing potential sinkholes, and paving roadside ditches to prevent surface water from seeping into the volatile soil. TDOT officially announced the I-40/I-81 Corridor Feasibility Study on July 27, 2007. The intent of this study is to assess deficiencies along I-40 and I-81 in Tennessee and to develop upgrade proposals for the existing corridor. This study was completed in 2008. On January 18, 2008, the Federal Highway Administration authorized the states of Mississippi and Tennessee to extend I-69 from the I-40/SR 300 interchange in north Memphis to the I-55/I-69 interchange in Hernando, Mississippi; however, Tennessee has not yet[update] signed the extension of the route, although Mississippi has already done so. Construction was recently completed on the I-40/I-240 interchange in East Memphis. This reconfiguration was needed since the original configuration was designed as if I-40 were to go through the center of the city along what is now Sam Cooper Boulevard. The first phase of the project replaced a one-lane loop ramp from I-40 westbound to I-240 southbound with a two-lane flyover. Portions of both Interstates were also widened slightly. This phase was completed in 2003. The second phase was stalled due to funding and redesign. It included the installation of the remaining flyover from the north loop of I-40 to I-40 eastbound. It replaced a one-lane ramp with a slow design speed that has been the site of several accidents over the years. Other parts of this phase included the widening of I-40 between Sycamore View Road and Covington Pike (requiring the replacement of the Wolf River Bridge with a 14-lane bridge), widening of I-240, addition of through lanes on Sam Cooper Boulevard, and reconfiguration of the Covington Pike interchange. The project cost $109 million (the highest bid project in TDOT history), began late 2013, and was completed by the late fall of 2016. A fifth interchange is being added along the stretch of interstate around Cookeville, and a road will be built leading to nearby U.S. Route 70N to help ease traffic along SR 56 (exit 280), SR 135 (exit 286), and SR 136 (exit 287). The initial route will be 2 lanes with a modified diamond interchange, with the right-of-way for future expansion. 176 I-840 east – Franklin I-840 exit 0; half-clover interchange. 235 I-840 west – Murfreesboro I-840 exit 76; trumpet interchange. 362 Industrial Park Road – Roane Regional Business and Technology Park Opened in 2008. ^ "Public Chapter 124 Senate Bill No. 122". State of Tennessee. Retrieved September 26, 2011. ^ Moore, Harry (1994). A Geologic Trip Across Tennessee by Interstate 40. Knoxville: University of Tennessee Press. pp. 108–109. ^ a b Tennessee Interstate: 1,049 Miles of Modern Highways to Serve the Motoring Public (PDF) (Pamphlet). Tennessee Department of Transportation. 1966. Archived from the original (PDF) on August 9, 2006. Retrieved April 6, 2019. ^ a b "Interstate System near Halfway Mark". The Tennessean. Nashville. October 27, 1966. Retrieved November 28, 2017. ^ "Interstate 40 Doesn't Really Hurt U.S. 70". The Tennessean. October 23, 1972. Retrieved February 26, 2018. ^ "Slide-Plagued I-40 Link Finally Opens". The Tennessean. Nashville. August 20, 1974. Retrieved April 18, 2019 – via Newspapers.com. ^ "Two Interstate Links in East Open Friday". The Tennessean. Nashville. December 18, 1974. p. 25. Retrieved April 18, 2019 – via Newspapers.com. ^ "I-40 Link Opening Near Knoxville". The Tennessean. Nashville. September 11, 1975. Retrieved April 18, 2019. ^ "Dunn Opens 96 Interstate Miles". The Tennessean. Nashville. December 21, 1974. p. 32. Retrieved April 18, 2018 – via Newspapers.com. ^ Moore (1994), pp. 112–113. ^ a b c Moore (1994), pp. 120–131. ^ Jacobs, Don (May 6, 2013). "Rock Slide Closes Land of I-40 in Roane County". Knoxville News Sentinel. ^ "I-40 Closed in Both Directions: Another Rock Slide". Raleigh, NC: WRAL-TV. July 1, 1997. Retrieved October 23, 2009. ^ Goumans, Corry & Wallace, Dwayne (1999). "I-40 Rockslide Causes Mountains of Problems" (PDF). Complete Abstracts of the ISEE Proceedings. 1G: 167. Archived from the original (PDF) on September 2, 2003. Retrieved October 23, 2009. ^ Hickman, Hayes. "Section of I-40 Closed Since Oct. Rockslide Reopens". Knoxville News Sentinel. Retrieved September 19, 2011. ^ "Tennessee Rock Slide Closes I-40 near Asheville". Raleigh, NC: WRAL-TV. Retrieved February 4, 2012. ^ Tennessee Department of Transportation (July 27, 2007). "TDOT Performing Corridor Study Along I-40 and I-81: Study to Identify Improvements for 550-Mile Interstate Corridor" (Press release). Tennessee Department of Transportation. Archived from the original on August 10, 2007. ^ Tennessee Department of Transportation. "I-40/I-81 Corridor Feasibility Study Project". Tennessee Department of Transportation. ^ Tennessee Department of Transportation. "Interstate 40 Interchange at Mine Lick Creek Road". Tennessee Department of Transportation. Retrieved February 17, 2017. ^ Fowler, Bob (October 9, 2008). "Roane Celebrates Access to Industrial Park via I-40". Knoxville News Sentinel.